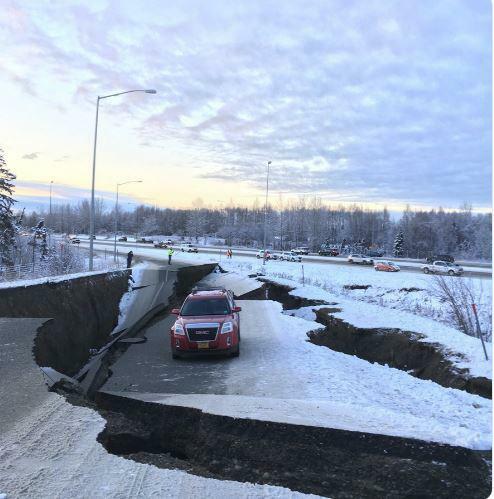 In Anchorage, a 7.0-magnitude earthquake caused major damage Friday morning, including this cracked exit ramp at Minnesota Drive and International Airport Road. Updated Friday 11/30 at 1:40 p.m. The National Tsunami Warning Center has canceled the tsunami warnings issued for southcentral Alaska Friday morning. NTWC officials say no tsunami is expected following a large earthquake that struck near Anchorage around 8:30 a.m. The Alaska Earthquake Center reported that the 7.0-magnitude quake hit seven miles north of Anchorage at a depth of 27 miles. NTWC officials have confirmed that it did not generate any tsunami waves. The Anchorage area is still experiencing strong aftershocks, including a 5.7-magnitude quake. According to residents and the Anchorage Police Department, there is major infrastructure damage across the city. Many homes and buildings are damaged, and many roads and bridges are closed. PenAir has canceled all of its Friday flights. Alaska Airlines also suspended operations at Ted Stevens International Airport in Anchorage while the damage was assessed. Unalaska and the Aleutian region were never under a tsunami warning or watch. The warnings had been issued for Kodiak, the Kenai Peninsula, and Cook Inlet. As of 9:15 a.m., the Aleutian region is not under a tsunami warning or watch, following a 7.0-preliminary magnitude earthquake near Anchorage on Friday morning. The National Tsunami Warning Center has issued a warning for Kodiak, the Kenai Peninsula, and Cook Inlet. Officials at the Unalaska Department of Public Safety say they are monitoring the situation. The National Weather Service canceled a tsunami warning for the Gulf of Alaska this morning, after a magnitude 7.9 earthquake struck near Kodiak around 12:30 a.m. In Unalaska, tsunami sirens started blaring at 1:50 a.m. – and residents were encouraged to move at least 50 feet above sea level. Around 200 people sheltered at city hall and the clinic including Iata Akopo. He’s new to Unalaska, but in 2009 he experienced a major tsunami at home in Samoa. A 7.8 magnitude earthquake near Russia’s Commander Islands briefly triggered a Tsunami Advisory for the Aleutian Chain this afternoon. The earthquake occurred at 3:34 AKST, and the U.S. Tsunami Warning System removed the warning within an hour of the quake. Unalaska’s Department of Public Safety provided updates during the Advisory on their information line at (907) 581 – 6080, and using Nixle alerts. A series of earthquakes shook the Aleutian Islands Monday morning, including a strong 6.4-magnitude quake near Adak. According to the Alaska Earthquake Center, the big event struck at 9 a.m. about 80 miles west of the community, where about 350 people live. “I would suspect that it was close enough to Adak that they should have felt it, but it’s probably not big enough to cause damage,” said seismologist Natalia Ruppert.